BUCHAREST (Romania), January 25 (SeeNews) - The European Investment Bank (EIB) is lending further 138 million euro ($157 million) to Romanian gas pipeline operator Transgaz [BSE:TGN] to finance the construction two new pipelines, the economy ministry said on Friday. The two projects will increase the security of natural gas deliveries and reduce energy dependence by diversifying sources and gas supply routes, the economy ministry said in a press release. EIB is lending Transgaz 100 million euro representing the second tranche of an approved loan worth 150 million euro for a new pipeline which will link Romania’s natural gas resources on the Black Sea shore with both the national gas transmission network and the BRUA gas transmission corridor linking Bulgaria, Romania, Hungary and Austria. The contract for the first tranche of 50 million was signed in December. "It is of strategic importance for the Black Sea gas to be circulated through the National Gas Transmission System to the Romanian and EU market in order to increase the security of gas supply to Romania and the EU," economy minister Niculae Badalau said. This connection to the European gas transmission grid will allow gas exports to neighboring European countries. The project involves the construction of a new 308 km-long transmission pipeline, along with the associated above-ground infrastructure. The new pipeline will be connected to the existing gas transmission system and the new BRUA transmission corridor in Podisor, located west of Bucharest. This transaction is backed by the European Fund for Strategic Investments (EFSI), the financial pillar of the Investment Plan for Europe, or "Juncker Plan". "The innovative projects signed today are important for Romania and Moldova as well as for the European Union. They contribute to the security of gas supplies and help to diversify energy resources. This increases the competitiveness in the energy sector with positive implications for clients in terms of fair prices and reliability," EIB Vice President Andrew McDowell said. 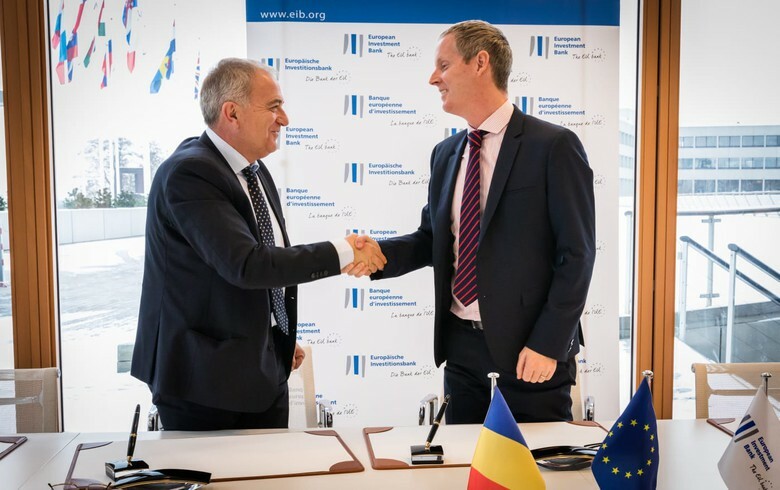 Also, EIB is lending Transgaz's Moldovan subsidiary Eurotransgaz 38 million euro to finance Vestmoldtransgaz for the Ungheni-Chisinau interconnection project. Transgaz took over its Moldovan peer Vestmoldtransgaz in September for 8.8 million euro through Eurotransgaz. Romanian prime minister Viorica Dancila said earlier this month that the construction of the Ungheni-Chisinau natural gas transmission pipeline in Moldova remains one of the top priority projects of her government. "For our company, the special cooperation with the European Investment Bank is meant to ensure a competitive funding for Transgaz’ strategic investment projects sustained by Romania’s Government and intended to actually contribute to the accomplishment of the EU goals for the sustainable development of the gas transmission infrastructure, the increase in the interconnectivity, the diversification of the gas supply sources and the safeguarding of energy security and solidarity," Transgaz director general Ion Sterian said. Transgaz shares traded 1.05% lower at 331 lei on the BVB as at 1006 CET on Friday.